"Sickle cell does not belong in the closet!" One of the greatest Ugandans who ever lived was Philly Bongoley Lutaya who in his own words gave Aids “a face". Taking on his philosophy is Ruth Nankanja a sickle cell patient. Ruth soon realized that people would rather sweep sickle cell under the carpet and forget about it... she knew only too well the stigma and discrimination faced by people with sickle cell in Uganda. 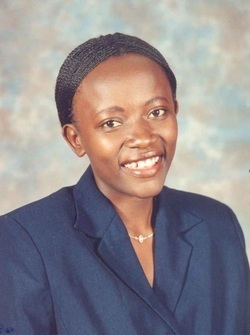 Yet once armed with scientific fact as to the cause of sickle cell disease, Ruth Nankanja committed herself, a number of other patients together with several health workers in order to change this state of affairs. Our Association is a non-profit organization dedicated to serving the local sickle cell disease community in Uganda. Sickle Cell Association of Uganda is now the only grass roots organisation representing the interests of patients in Uganda. We strive to change the perception that the majority of the population has in Uganda about the disease - that those who have this disease are worthless people in society, worth stigmatising and discriminating against. Through counselling and education we strive to improve the lives of these families. God centered holistic sickle cell care. The available data, compiled in the early 1970’s, shows that trait frequency in Uganda is 20% of the population. That is, sixty six million people are at a risk of having a child with sickle cell disease. It is estimated that 33,000 babies are born each year with the disease of whom 80% die before celebrating their fifth birthday. The Bamba people in the south west of Uganda carry 45% of the gene which is the highest trait frequency ever registered in the world. There is inadequate data concerning Sickle cell disease due to lack of funds for research. Nothing is known despite the many deaths that are seen daily. The Sickle cell Clinic in Mulago (National Referral and teaching hospital) has over 7000 patients registered with it and on average sees 200 patients 5 days a week. Sadly this is the only Sickle cell clinic and it is a day care centre operating from Monday to Friday yet Sickle cell patients get attacks at any time. Join hands to make a difference in these children's lives for the majority of the sufferers are young. The only Sickle cell Clinic is in MulagoHospital yet Sickle cell disease is widely spread throughout the whole country. Awareness is still low because the Sickle cell Association of Uganda, which is carrying out this activity, has limited funding and only manages to reach out to few communities. However, Sickle cell is a forgotten enemy which desperately needs to be addressed. Please get in touch here to offer comments, join our mailing list, help in any way or to make a donation.